In April, Open Garden released its FireChat app for Android, giving the world’s largest smartphone OS access to the anonymous, hyperlocal messaging app that iOS users were already downloading like crazy. There was only one glaring problem: There was no interoperability between the two smartphone platforms. If you were in a room full of FireChat users, the iPhone and iPad users could all chat with one another, and the Android device users could do the same. But no Android device could link up with an iOS device, or vice versa. While not exactly a tragedy of Shakespearian propositions, Open Garden has managed to write this play a happy ending. 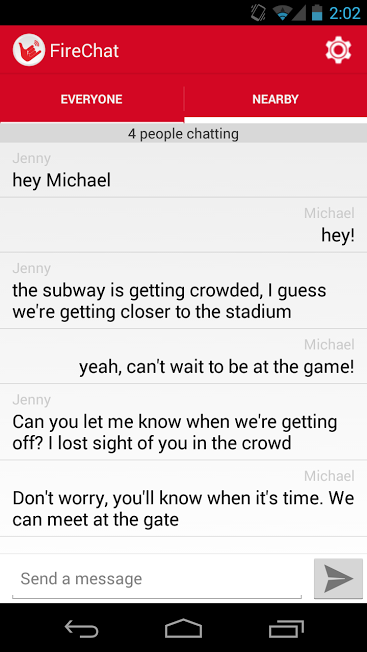 On Tuesday it released a new version of FireChat, dubbed FireChat Love, that links the two platforms together. iOS and Android devices can now collectively form ad hoc mesh networks over Wi-Fi and Bluetooth and message one another without an internet connection. Open Garden’s ultimate goal is to overcome the barriers that prevent Android and iOS devices forming direct peer-to-peer connections at the OS level, but VP of sales and marketing Christophe Daligault said Open Garden hasn’t quite gotten there. In the case of FireChat Love, Open Garden has managed to use its own mesh networking technology to bridge the platforms on the app level, he said. Though Open Garden is most known for FireChat, its purview is much broader than messaging. It’s developing mesh technologies that will let any manner of devices form vast networks that not only to share information but also their broadband connections. It’s managed to connect Androids, Macs, and Windows PCs to this larger mesh, but it still hasn’t succeeded in bringing iOS to the party. For those of us in the business continuity game, where communications is a key enabler to positive recovery outcomes, apps such as this FireChat, is worthy are deeper analysis. The approach championed by Open Garden is innovative, as it delivers an alternative to the conventional solutions that are either tied to wireless providers or that use proprietary means. Would be interested in knowing if anyone is working on a BlackBerry port using Android APK? BB is still big in Govt, first response and other civic orgs due to its inherent security. This brings some coolness to the stodginess of business continuity. My recommendation would also include Photo4Tune which is comparatively new but has got all the qualities to build user addiction. It has got a nice interface for photo sharing, a feature for creating events just like facebook and not to forget about the Fire messaging options. WhatsApp uses the mobile network’s data channel or Wi-Fi to connect through the internet. FireChat can link directly to other nearby devices through Bluetooth or Wi-Fi direct with the internet acting as an intermediary. Basically instead of chatting with your friends wherever they are in the world. You’re chatting with anyone in your general vicinity. I think you kind of missed the point of Firechat.